Skip the takeout and make your own Sesame Beef and Broccoli at home in less time than it takes for delivery. Super simple and packed full of flavor. 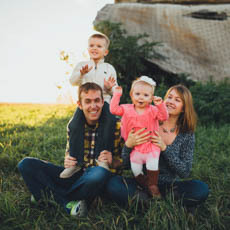 **Update: the recipe, photos and text have been updated since the original posting date in 2012. Chinese food is always my go-to when we’ve had a long, busy, draining day and I just don’t have much desire to cook. Sometimes that means ordering from our favorite local spot and sometimes that means throwing something simple together at home. Depending on just how long the day was of course. It’s one of my favorite cuisines to eat and make at home for a few reasons. Recipes can sometimes contains a big ingredient list and that can be really daunting sometimes. But if you keep some basic staples in your pantry, you’ll be able to whip something up pretty simply without much effort. Chinese food is almost always quick and easy to prepare so that’s a huge plus. I’m talking you can have it done before you would be able to have it delivered. Chopping is usually the most time-consuming part of takeout food at home and once that’s done it’s usually only 10 minutes before it hits your plate. The quick and easy part is especially true of this Sesame Beef and Broccoli. And bonus, the ingredient list is pretty small and standard so if you keep some Asian sauces and condiments stocked at home you may have everything you need already. And if you don’t, you can find them all at any grocery store. I promise. 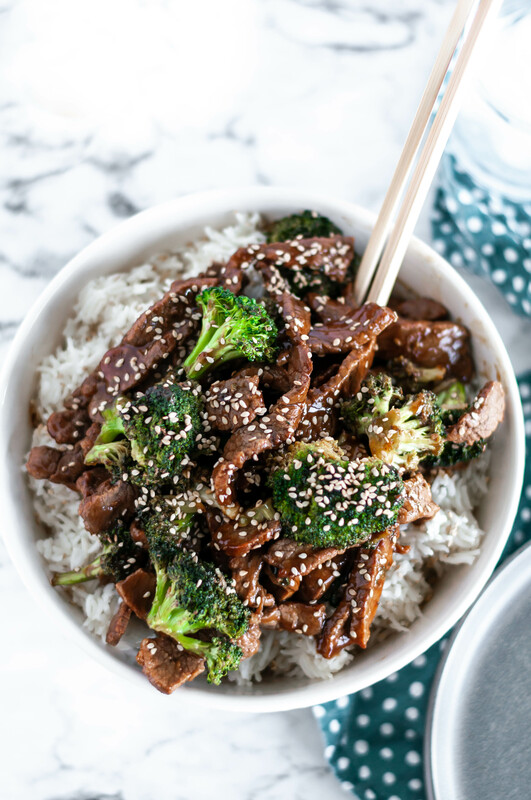 This Sesame Beef and Broccoli is more flavorful than the standard takeout version. I sometimes find beef and broccoli kind of bland so I wanted to boost the flavor in this fakeout recipe to really amp up the sauce. The addition of sesame oil did just that. It adds a deep, nutty flavor without completely overpowering the sauce. Brow sugar adds some sweetness and cuts the saltiness of the soy sauce which is the main component of the sauce. With sesame oil, a little goes a long way so the small amount in the recipe really makes a big flavor impact on the whole dish. Then adding sesame seeds really brings home the flavor and adds a little texture. Because the beef and broccoli is cooked in about 10 minutes, the beef stays tender and the broccoli cooks off the raw taste but still keeps a nice crunch which is a must in a dish like this. I like this on its own or served over a big scoop of rice. It’s saucy enough to drizzle a little extra sauce over the rice which is an absolute requirement in my book when it comes to Chinese food. The saucier the better. Heat 1 tablespoon of oil in a large skillet or wok over medium-high heat. Add broccoli and cook, stirring often, for 3 minutes. Remove to a plate and place wok back over heat. Add remaining 1 tablespoon of oil and beef to the skillet. Cook, stirring often, until browned, 3 to 4 minutes. While beef is cooking, in a small bowl stir together the soy sauce, brown sugar, rice vinegar, sesame oil, garlic and cornstarch. Set aside. Add broccoli back to the skillet along with the sauce. Stir together and cook until sauce is thickened, about 2 minutes. This dish looks so delicious! It’s making me hungry just reading about it. Thanks for sharing! Same girl, same. Thanks so much!